Products from Heavenly Organics are 100% vegan, organic and natural (free from synthetic ingredients). The range includes body and facial scrubs, lip balm, foot balm, hand lotion and refills are available. I decided to buy the Lavender Solid Hand Lotion. Unlike other hand lotions I own this one is solid and packaged in a tin. The tin is travel friendly, no worries about leaks and the size is convenient for handbags (15g). The fragrance is pleasant and I do not find it overpowering. The product is easy to use by simply swiping over hands and then massaging hands together. I find the lotion effective and not heavy or greasy although I do prefer using it at bed time rather than during the day at work. The ingredients are simple but effective (Organic Cocoa Butter, Organic Shea Butter, Organic Lavender Essential Oil) making them ideal for all skin types. Overall this is a nice little product for £6 (free UK postage). I've tried this. It smells lovely and does last, but didn't nourish my skin as well as the Manuka Dr Organics that you tipped me off about. However, I'm always washing my hands, so anything I put on my skin has to work really hard!! I'm a big fan of Heavenly Organics solid hand lotion too. 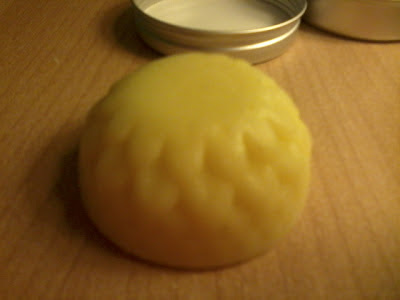 I've also just bought one of their peppermint foot balms to try and can thoroughly recommend that as well. A treat for your feet!